I'm completely new to Arduino and do not have an electronics background. I'm really keen to do a POC on home automation. As a start, I decided to switch on a tube light using ESP8266, Arduino Uno R3 and isolated relay. I have read that this can be done without arduino also. I'm able to switch on and switch off the relay without any problem. But when the relay is connected to the tube light, the ESP8266 stops responding. I couldn't find what was causing the issue. I also read that the ESP2866 should be powered properly to function correctly. 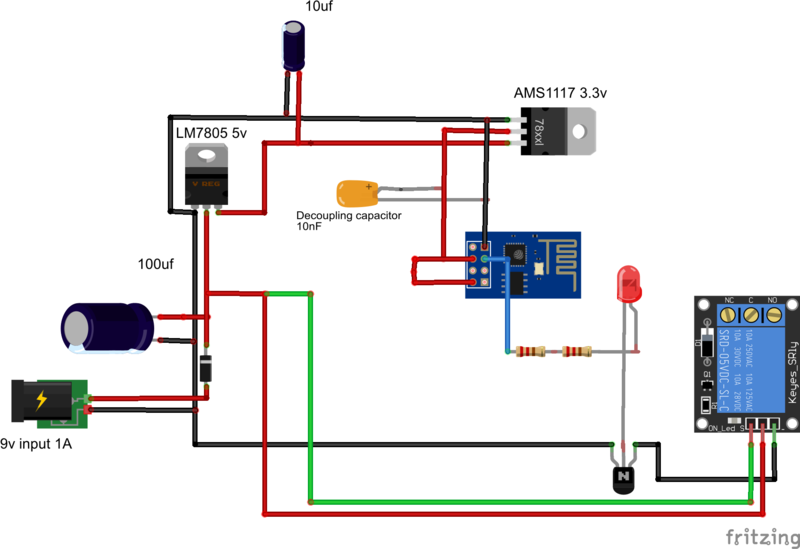 I'm following the wiring schema 5 mentioned in the link http://yaab-arduino.blogspot.in/2015/03/esp8266-wiring-schemas.html. SoftwareSerial esp8266(2, 3); // make RX Arduino line is pin 2, make TX Arduino line is pin 3. The above code works perfectly until I connect the tube light to the relay. The power supply used in 9v 1A wall adapter. The relay used is http://www.amazon.in/gp/product/B00LL0M6RS?psc=1&redirect=true&ref_=oh_aui_detailpage_o03_s00. The v+ of the relay is connected directly to the wall adapters voltage and ground to ground of wall adapter. 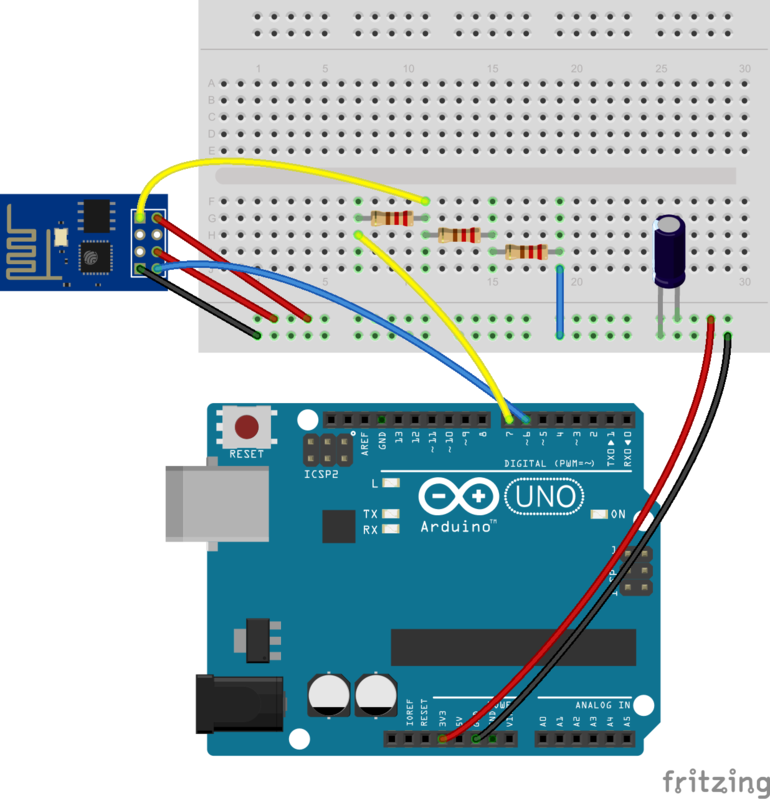 The input of the relay is connected to Arduino digital pin 8. I'm really struggling hard to proceed here. Any help or hint would be much appreciated. If you are doing what you have said you are doing then I think the answer is so obvious no one will ever see it. You say you have a 9V 1A power supply. Since you are powering the Arduino from this it is DC. Is that correct? You are connecting an "AC Tube light" to the relay (which supports 1A 12V DC). If you are connecting an AC device to a DC supply then things probably do go wrong. To test everything is working properly can you switch the AC light for a DC light? I think you can get Relays with AC output and a DC Switching signal, but that will need a bit of research. Hope that helps, if not comment and I'll try again. Finally I got this working using only ESP8266 and minor tweaks. I'll post the circuit here just in case if somebody is trying to do the same thing. Please note that this was done as a POC and I'm not from an electronics background. Kindly note the blue wire from the GPIO 01 to resistor and an LED. I had to do this because when the circuit is powered on a HIGH signal is sent from the GPIO and the relay is turned on. I think it is the default behaviour of ESP8266. To suppress this initial flow, I did this (There may be a better way to do this according to electronics experts). I'm posting my init.lua below. If everything is running, connect your phone or computer to the same wifi using "<ssid>","<password>" and access the IP 192.168.1.101 to see a webpage with one buttons "ON" and "OFF". Click on it an check whether it is working.